What does sustainability, for our planet, really mean? How can innovation with materials and design propel us forward, as a race? Designers today are interpreting and answering these questions in different ways. For Angela Mathis, the answer lies as close to the human-body, and human-life as possible. Delving into an interdisciplinary world of new materials, technology, and scientific practices, her work breaks down the invisible barrier that exists between man and designed objects–instead, her inventions interface viscerally with skin and bones, and seek to both heal and evolve human conditions. 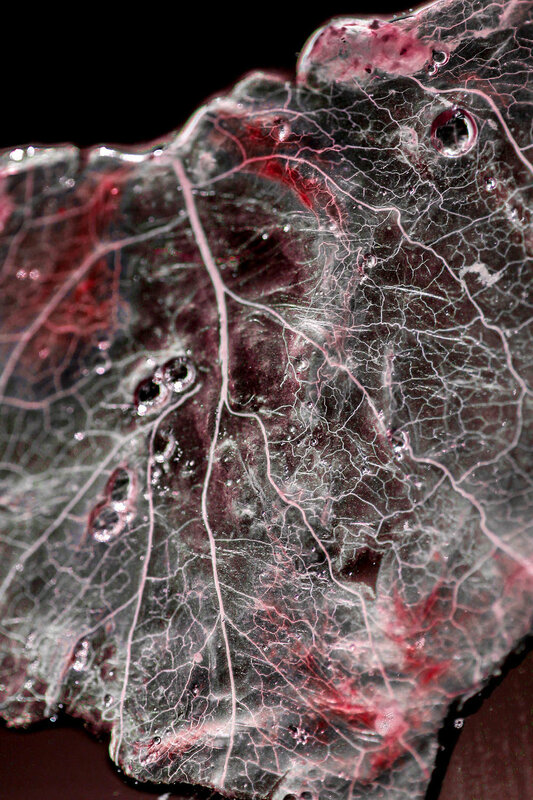 From projects such as her Blood Coagulation Textile and spray to her Photosynthetic Fabric, and to her most recent work–Ectosymbiont (which explores plant-based tissue engineering)–her graduating project at Central Saint Martins in London, Mathis’ work is increasingly pushing the boundaries of Biomaterials and Biodesign. Having trained in industrial design, product design and most recently in material-futures–Mathis' multidisciplinary background feeds into a holistic investigation of materials, all towards human-centered design. Angela Mathis' Blood Coagulation Textile and Spray uses crystals of Potassium Alum to stop the flow of blood upon injury. At the heart of it all, is her unique perspective on sustainability and what ‘taking care of the planet’ really means–both of which explain the human-focused nature of her works. “Taking care of the planet means taking care of ourselves, and our immediate habitat. More so than any distant, larger-than life goal for the planet, we have the opportunity to create the most impact to the environment by designing to improve conditions of the human body” she says. Through her project Ectosymbiont, Mathis makes this idea tangible and extremely palpable. Ectosymbiont uses the method of Decellularization, where plant cells are washed away from samples of various species, leaving a scaffold or structure behind that is suitable for the growth of human cells instead. The project responds to the challenges involved in traditional organ transplantation and the loss of lives resulting in its limitations, as well as the illegal organ trade sparked by it. At the same time, Ectosymbiont exposes the potential of plant-based tissue engineering and transplantation of its results into the human body. Ectosymbiont, by Angela Mathis, uses the decellularization of plants, to create scaffolds for human tissue engineering. Mathis says “Using plants for tissue engineering is an inexpensive and always available alternative; it guarantees an even distribution of nutrition, eliminates the problem of transplant rejection and doesn't bring with it ethical challenges, in comparison to using animal organs. It is the mass solution we are looking for. As soon as we will be able to cross kingdoms and the first human is living with a transplanted plant tissue, we evolve us, the human species, to the Homo Ectosymbiont.” Ectosymbiont was most recently seen at Interfiliere in Paris, a leading trade show for body-fashion. Given Mathis' unique implementation of Biodesign and Biomaterials, we were eager to speak with her. Recently we interacted with her and learned more about her process, and motivations as a designer, as well as some of her current upcoming projects. This conversation is transcribed below. MD: From industrial design to product design, and onward to material design: what led to your fascination with materials, and has fueled your work in this realm? Angela: My interest in exploring materials started early, even before my studies began. I was always tinkering around, and building objects of my own. Professionally, I spent four years as a visual merchandiser, before studying industrial design.During this time I witnessed the immense amount of material that was wasted in the industry. I questioned how this could be the future for us, and decided that my approach would be to change these materials at the source–a decision that prompted me to study design and later, material futures. While I was working in mediums such as ceramic and glass, and using varied materials while studying product design, I was also researching the materials themselves, employing my access to other schools within the university to do so. It was around this time that I found myself drawn to the idea of interactive and bio-based materials. A continuing investigation of materials, and passion for biodesign: Photosynthetic Fabric by Angela Mathis mimics the natural process of photosynthesis through its structure and use of materials, allowing us to turn CO2 into oxygen while walking. MD: From your past projects such as the Blood Coagulation Textile, and Photosynthetic Fabric, and now Ectosymbiont–it seems that your work has a distinct focus on the human body. Tell us a little about that. And how do biomaterials fit into this? Angela: We humans are kind of unstoppable, aren’t we? Or we consider ourselves to be. We seek to improve ourselves all the time, and our surrounding conditions as well. That is one of my motivations for gravitating towards design that is human-focused. Another is my belief that taking care of the planet boils down to taking care of ourselves first–an idea that we can relate to better. Towards that end, to my mind, biomaterials are best aligned with this continuing goal and quest we have as a race, more so than any other conventional materials. Photosynthetic Fabric by Angela Mathis mimics the natural process of photosynthesis, allowing us to turn CO2 into oxygen while walking. The faster one moves, the more air gets cleaned; “Run and clean the planet” is the message for the project. Photosynthetic Fabric by Angela Mathis mimics the natural process of photosynthesis through its structure and use of materials, allowing us to turn CO2 into oxygen while walking. I also think, that with the advent of design thinking, and its increasing popularity in all sectors of the industry, there is the ability for designers to become a part of diverse companies, and not be compelled to strictly create products or objects. Rather they can support the development of more human-focused inventions, and innovations that are still in process. MD: You recently presented Ectosymbiont as your graduating project at Central Saint Martins. What reactions did you receive to the project? Angela: The project is hard to explain in a single sentence, so naturally, the reaction was a two-part one. The first was an incredulous moment where people questioned if this was “real” or if it wasn't too abstract; followed by a more intrigued, acceptance of the project, after learning more about its process and intent. In reality, the concept of plant-tissue based tissue engineering is being delved into by scientists extensively. Researchers from Worcester Polytechnic Institute are part of a multidisciplinary team with the University of Wisconsin-Madison, and Arkansas State University-Jonesboro that is exploring plant scaffolds for human tissue engineering. At this time, the team has managed to culture beating human heart cells on a scaffold of spinach leaves that were stripped of plant cells. Ectosymbiont, by Angela Mathis, suggests plant-based tissue engineering, ripe for transplanation into the human body. I hope to interact with this team of scientists further in the coming days, and also continue to develop my project–which currently archives over 100 types decellularized plant structures–as scaffolds for human tissue generation. I can’t wait to see where this technology and process of plant-tissue engineering will lead us; to large scale applications in medicine, and in particular organ transplantation in the next ten years. MD: Angela, another project of yours that is very fascinating to us, is the Blood Coagulation Textile. Can you tell us a little more about this? Angela: For me, this project began with understanding the advantages and disadvantages of the material–Potassium Alum. This material isn't new–ancient Romans used Alum to stop the flow of blood two and a half thousand years ago. Angela Mathis' Blood Coagulation Textile uses crystals of Potassium Alum to stop the flow of blood upon injury. I was motivated by the intent to cope with sports injuries, and providing a rapid solution to injuries of the human body. Potassium Alum has the unique characteristic to make blood coagulate faster, and so it aligned with the idea of stopping bleeding after sports injuries which are frequently caused by falling. 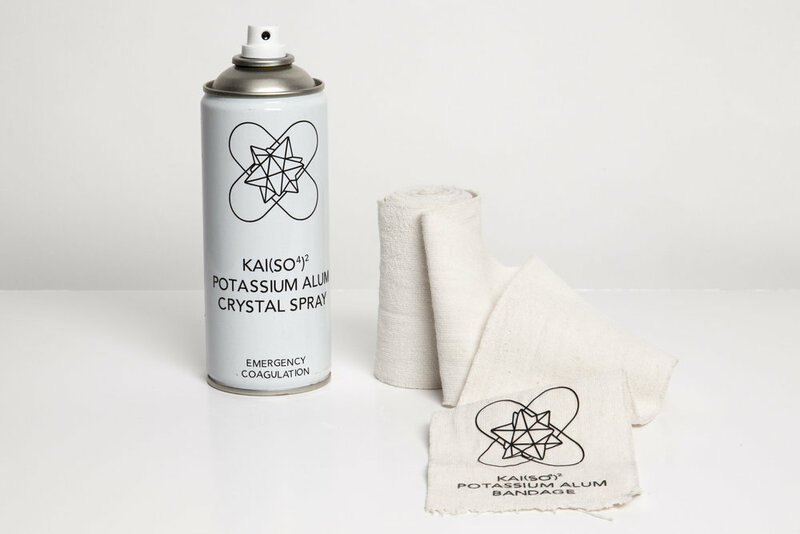 I experimented with potassium alum integrated into textile, as well an alum spray of the crystals, which will be able to stop blood immediately and save a person’s life on the way to the hospital. MD: In a very different direction from some of these recent works is your project Banknote Textiles, which received lots of traction some time back. Are you still exploring this material? Angela: I am. I am looking to develop and use this material further. I have been in talks with a shoemaking company for applications of the material. As you know, it makes use of a variety of banknotes, which after their limited lifespan of 18 months (on an average), are decommissioned and burned. In my project, these old notes are adapted to serve a new purpose, forming a diverse textile collection capable of being applied to various upholstery and other design needs. VALUE: A Material from Banknotes, a project by Angela Mathis explores the functionality of banknotes after they have been decomissioned after a short life span. Readers, if you would like to learn more about Angela's work, do click here.